00:20:00 6 servings, 1 topped tomato half (150 g) each. 6 servings, 1 topped tomato half (150 g) each. This simple side dish uses on-hand ingredients and takes minutes to prepare. 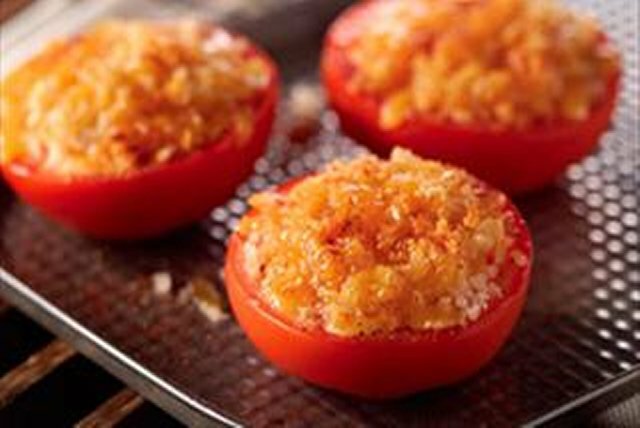 Tomatoes, Cheddar and a crunchy topping take this vegetable side from basic to delicious. Cut thin slice from bottom of each tomato half; discard. Place tomatoes on rack of broiler pan; sprinkle with salt and pepper. Combine bread crumbs, cheese and butter; spoon over tomatoes. Sprinkle with paprika. Broil, 4 inches from heat, 5 min. or until cheese is melted. Tear bread slices into pieces, then process into crumbs using a blender or food processor. Serve this cheesy side dish with a serving of cooked lean meat and a mixed green salad tossed with your favorite KRAFT Light Dressing. Serving Size 6 servings, 1 topped tomato half (150 g) each.